Shot yesterday late afternoon. I was shooting owls in the woods and sun was going down. 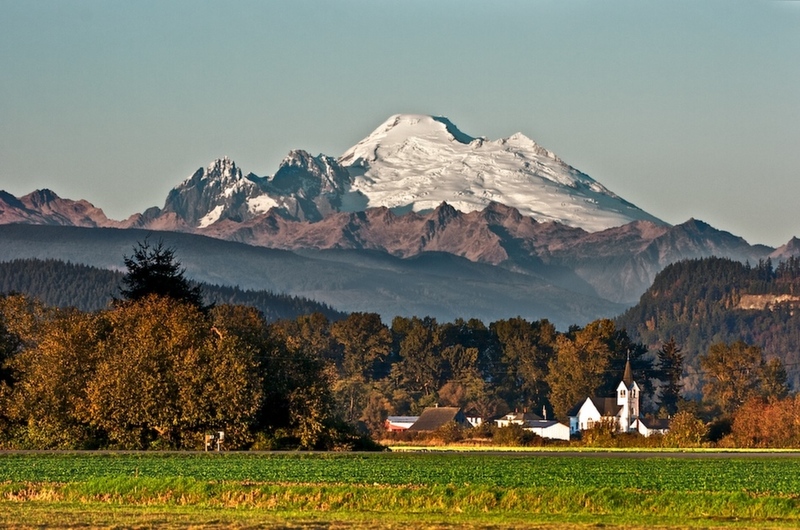 I couldn't resist to take this shot of the church and the Mount Baker in the background. That Mount Baker is about 50 miles (80km) away, air was very clear with a good visibility. I was shooting with lees than ideal gear Nikon D2Hs (4.1MB) body with Nikon 200-500mm f/5.6 lens. I zoomed out all the way out to 200mm and lower ISO to lowest ISO-200. This is pretty much my back yard almost. Those green fields get filled with Snow Geese in winter by thousands. Ludo, how lucky you are to have this as your 'back yard'! What a stunningly beautiful area you live in, and this is a gorgeous view. A click shows off the lovely detail - and what a wonderful composition with the white church and buildings complementing the snow tipped peak behind. The late afternoon sun bathing the scene and all the different layers in warm light is the icing on the cake. What a gorgeous scene in the sunset light- so many lovely elements and contrasting bands of color. I love how the white church complements the snowy peak (as Carol mentioned) . You are indeed blessed with a magnificent backyard! Now let's see this with the snow geese when they arrive! Beautiful homeland and wonderful photograph, Ludo. Another vote to see the snow geese once they arrive. Clever composition with those corresponding white areas. I like it. Ludo, what a treat to see your playground! I love all the line layers from the foreground all the way back to Mount Baker - first the linear, more man-made setting, on up to the treetops, the rolling shapes, on up to the craggy, and finally topped with the snow-capped mountain. Terrific scenery with wonderful clarity and the lovely late afternoon light - beautifully done!